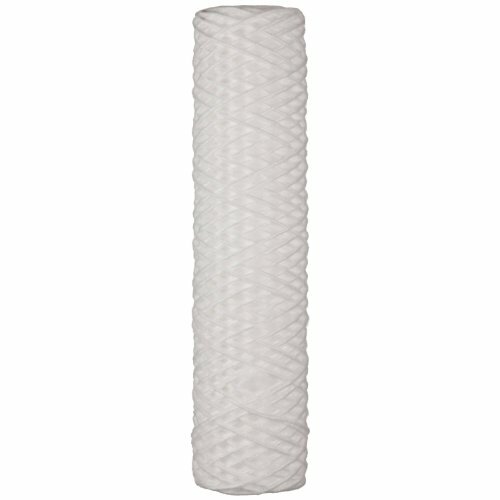 This Parker Fulflo Honeycomb series string-wound filter cartridge is for multi-purpose filtration in industrial process applications. It has a polypropylene core with a string-wound, industrial-grade polypropylene medium for performance consistency. This filter has an effective nominal, 90 percent removal efficiency at micron rating, and an upper operating temperature limit of 120 degrees F. Its irregular, outer layer helps reduce surface blinding, helping to ensure longer cartridge life and full utilization of entire cartridge. This filter cartridge is suitable for organic acids and solvents, petroleum oils, membrane prefiltration, concentrated and diluted alkalis, water, and chemical processes. Industrial process filter cartridges and bags remove pollutants and submicronic contaminants from a variety of process industry applications. When combined with companion vessels or housing units, the cartridges achieve microfiltration by trapping particles within the layers of the filter material within the cartridge. Filter cartridges are available in a multitude of configurations, sizes, and materials, such as membrane filters, pleated filters, and depth media, among others. Filter cartridges can be constructed of FDA-grade cotton, rayon, and polypropylene, or industrial grade polypropylene or cotton, for example. Some have solid cores, which are commonly made of tinned steel, stainless steel, or polypropylene. Industrial process filters and bags are used in a wide range of applications, including food processing, chemical processing, petroleum oils, paints, inks and coatings, among others.